Welcome to the official website of BELGIAN MASTER, the most famous one-loftrace in Belgium ! 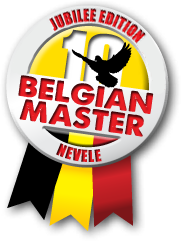 With the BELGIAN MASTER 2017 the one-loft-race Belgian Master sets in its 10th edition. The first editions were an overwhelming success, as well for the organisational part as for the participants and the international appearance. Check out the rest of this website for more information about regulations, prize money and various competitions. JOIN US AND WIN !